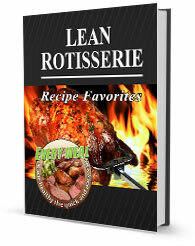 The Lean Rotisserie recipe favorites is a collection of your favorite recipes with lower fat and calorie content for anyone who is watching their weight or is generally health conscious. You can enjoy a wide variety of foods by "Cutting the Fat" at home and making lean and tasty meals your family will love! With 240 pages and over 200 recipes with entire chapters devoted to delicious recipes for poultry, beef, pork, lamb, seafood and more. The Lean Rotisserie Recipe Favorites is your ultimate guide to healthy cooking!